Half of all U.S. adults now have a mobile connection to the web through either a smartphone or tablet, significantly more than a year ago, and this has major implications for how news will be consumed and paid for, according to a detailed new survey of news use on mobile devices by the Pew Research Center’s Project for Excellence in Journalism (PEJ) in collaboration with The Economist Group. At the center of the recent growth in mobile is the rapid embrace by Americans of the tablet computer. Nearly a quarter of U.S. adults, 22%, now own a tablet device-double the number from a year earlier. Another 3% of adults regularly use a tablet owned by someone else in their home. And nearly a quarter of those who don’t have a tablet, 23%, plan to get one in the next six months. Even more U.S. adults (44%) have smartphones, according to the survey, up from 35% in May 2011. Mobile users, moreover, are not just checking headlines on their devices, although nearly all use the devices for the latest new updates. Many also are reading longer news stories – 73% of adults who consume news on their tablet read in-depth articles at least sometimes, including 19% who do so daily. Fully 61% of smartphone news consumers at least sometimes read longer stories, 11% regularly. These findings and others in this report build upon a comprehensive study conducted by PEJ and The Economist Group a year ago that provided an in-depth look at news consumption on tablets among early adopters. 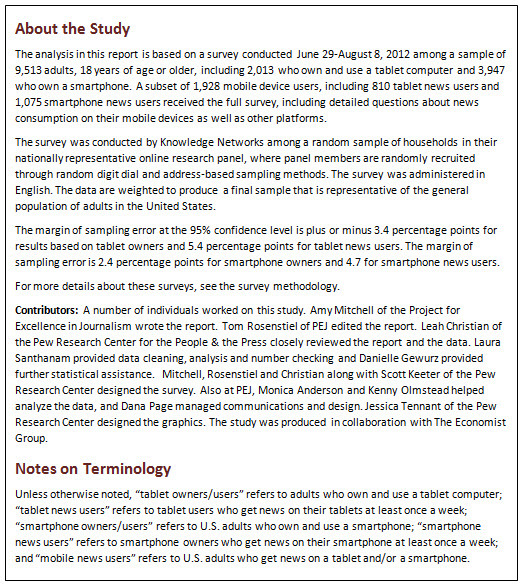 The new report, which is based on a survey of 9,513 U.S. adults conducted from June-August 2012 (including 4,638 mobile device owners), probes mobile news habits more deeply across the wider population of users, looks at smart phone use as well, and examines the financial implications of those habits for news. The survey also finds that consumers have yet to embrace certain features that mobile devices offer. While mobile technology allows people to get news anywhere, and any time, most people get news on these devices when they are at home-and roughly half of mobile news users get news on their device just once a day. Similarly, the use of news apps on mobile devices, which many publishers hoped would be a way to charge for content, remains limited. Most people still use a browser for news on their tablet. Perhaps most pressing for the industry, the survey shows continued resistance to paying for content on mobile devices. More mobile news users have print-only subscriptions than have digital ones. Just 24% of them are considering exchanging their print subscription for a digital one (though these tend to be younger subscribers, which suggests their numbers will grow). When it comes to advertising, there are suggestions that ads seeking to deliver a message or reinforce a brand may have more potential than those tied to e-commerce. Taken together, the data reveal that, even with a broadening population owning mobile devices that offer a range of activities, owners are still drawn heavily to news. What’s more, there is a sizable cohort using mobile devices to broaden and strengthen their news experience, particularly male mobile news consumers who employ both apps and browsers, have a wireless data plan, get news multiple times throughout the day, and across a wide variety of platforms. Rather than replacing old technology, the introduction of new devices and formats is creating a new kind of “multi-platform” news consumer. More than half, 54%, of tablet news users, for instance, also get news on a smartphone; 77% get news on a desktop/laptop; 50% get news in print, and a quarter get news on all four platforms. Among smartphone news users, 47% still get news in print, while 75% get news on the laptop/desktop device and 28% get news on a tablet. There is growing evidence that mobile devices are adding to how much news people get. As many as 43% say the news they get on their tablets is adding to their overall news consumption. And almost a third, 31%, said they get news from new sources on their tablet. The increases in news activity is heaviest among those who use all four of the major text-based media for news-computers, smartphones, tablets and print. And when people are asked to recall time spent, the evidence suggests multi-device users spend as much time on each platform as other news users-not substituting one for another. 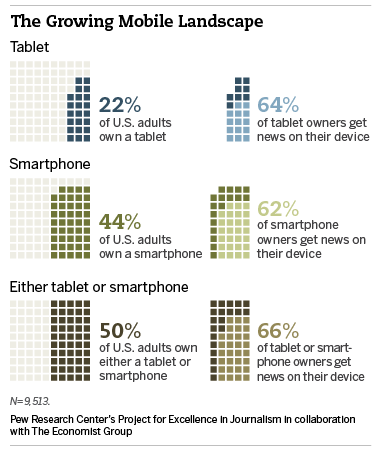 People who get news on both a smartphone and a tablet may carry added appeal for news organizations. These people tend to be more engaged news users than those who get news on just one device. They are more likely to read deeply (fully 82% sometimes or regularly read in-depth articles on their tablet compared with 62% of those who get news on just the tablet), to send or receive news through email or social networks and to read past issues of magazines. And, while the numbers are still small, dual-device mobile news user are also more likely than others to have paid for digital news content. Similarly, those who get news throughout the day on their mobile devices are more engaged news consumers. People who get news on their devices multiple times per day, on either the smartphone or tablet, tend to turn to more sources, get news from new sources, read in-depth news articles, watch news videos, and send and receive news through email or social networks. Tablet news consumers who get news more than one time during the day are also twice as likely as those who get news once a day to have paid for news on their tablet (10% versus 4%). Two distinct news audiences have emerged on tablets-new-found digital customers and customers who also remain loyal to the print product. Nearly a fifth of mobile news users, 19%, have paid for a digital news subscription of some kind in the last year, and a third of tablet news users with digital subscriptions have added new subscriptions since they acquired the device. But even more mobile news users, 31%, have print-only subscriptions, and three quarters of these have no plans to give them up. These print subscribers also prefer their app-based news to be more like a traditional reading experience rather than to have high-tech features. For the news organizations, this brings both the potential for new audiences as well as the challenge of accommodating the differing styles and approaches of these distinct audiences. People notice ads on mobile devices and may be even more likely to click on them than they are to click on other digital ads. Half of mobile news users (49% of tablet news users and 50% of smartphone news users) sometimes or often notice ads when they are getting news on their mobile device. Following or acting on these ads is less common: Roughly 15% click on ads when getting news on one of the mobile devices and about 7% actually buy something. These figures, however, outpace other digital click-through rates. A recent study by Ad Age finds click-through rates on browser-based display ads to be less than 1%. There has been movement over the last year toward using the browser rather than apps for tablet news consumption. Fully 60% of tablet news users mainly use the browser to get news on their tablet, just 23% get news mostly through apps and 16% use both equally. In 2011, 40% got news mostly through a browser, 21% mostly through apps and 31% used both equally. But as was revealed in the 2011 survey, app news users-and those who use both apps and the browser equally-remain in many ways more engaged and deeper news users than those who mostly use their browser. The browser is preferred on the smartphone as well (61% get news mostly through a browser, 28% mostly through apps and 11% use both equally). These mobile news users were also asked about their news habits on the conventional laptop/desktop computer. Their responses suggest that even as the population of tablet owners broadens, the idea that we have entered a post-PC era is overstated-at least when it comes to news. The desktop computer remains an enduring part of people’s news consumption-perhaps because during weekdays it is a work tool. Despite all of the convenience of mobile, fully 41% of mobile users who still get news on the laptop and print prefer the conventional computer for doing so. Tablets rank second at 25%, followed by print. The smartphone ranked last. This is a shift from the very early adopters surveyed in 2011 who showed strong passion for their new devices, and it may speak to both the broadening population and a natural settling down as the “newness” factor wears off.